Writer-director John Michael McDonagh (brother of In Bruges’ Martin McDonagh) makes his feature length directorial debut with action-comedy The Guard – a welcome variation on the typical buddy-cop format. 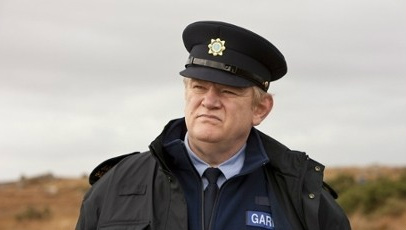 The film centres on Gerry Boyle (Brendan Gleeson): a drug-taking, prostitute-loving and socially unorthodox Irish cop who – when an international drug-smuggling gang decides to start using the small town as a hub for their illegal deliveries – is teamed up with FBI agent Wendell Everett (Don Cheadle) to investigate. What ensues follows a fairly typical action-comedy structure, and it doesn’t deviate much throughout the majority of the film. However, rather than focusing heavily on forgettable plot strands, McDonagh admirably shifts the attention to Boyle’s character, and occasionally to his peculiar relationship with Everett. He lets the subplots arise from and fall back into the background in equal measure. At times, the narrative wavers enough for viewers to begin to question the film’s purpose and overall direction, but it mostly remains surprisingly focused. For a debut feature, this is no easy task. McDonagh’s script, much like his brother’s for In Bruges, is packed full of profane humour, unforgettable one-liners and an array of distinctive characters. He has also instilled it with a subtle, yet acutely aware social commentary that not only impiously takes the piss out of Irish culture, but also makes you very aware of the seriousness of the underlying racism and the lay of the law. It often playfully nudges at the edge of disbelief, but – considering the comical take on the subject matter – it always reins itself in and never pushes the audience too far. The dialogue in particular is extremely enjoyable, breathing life into each individual character, while the welcome self-awareness pays undeniable homage to the likes of Edgar Wright and Diablo Cody. Gleeson nails Boyle’s unconventional nature perfectly, and he delivers a wonderfully whimsical and forthright performance, adding a feeling of improvisation to the already blistering dialogue. This is also evident in the way he approaches the relationship with Cheadle’s uptight Everett. Despite being almost polar opposites, the pair share a tangible bond. Big fans of Cheadle may be displeased at how little screen time Everett is allowed, but this is Gleeson’s vehicle through and through. While it’s a shame that his character’s background and ethics are skimmed over, it simply wouldn’t make sense for McDonagh to spend any more time on the supporting cast. Admittedly, they all hold their own in their respective roles, with Mark Strong and Fionnula Flanagan delivering particularly noteworthy performances. Strong inhabits the lead drug-smuggler Clive Cornell with a cool ease, while Flanagan delights as Boyle’s whiskey-swigging mother. Aside from a comparatively inconclusive and evasive third act and the under-explored dynamic between Boyle and the trio of villains, The Guard is an admirably executed and often hilarious variation on the overdone action-comedy genre, elevated by stand-out performances across the board and an extraordinarily well-executed script from McDonagh.